This chapter is one of the most important passages in the Bible. It stands out among the chapters of the Old Testament like a mountain peak. The emotions of both Abraham and Isaac are understated, but very powerful. What Christian parent hasn’t read this and felt the pain of Abraham as he binds his son and places him on the altar? And who hasn’t flinched a little when he raises the knife “to slaughter his son”? The important thing to remember in this chapter is how it is introduced in verse 1: “God tested Abraham.” This was a test, an examination to prove and reveal Abraham’s faith. STEP 1 – When God said “go” Abraham went (v.2-3). No questions, no excuses, no rationalizing. He was simply and immediately obedient. He could act that way because he trusted the heart of the One calling the shots. 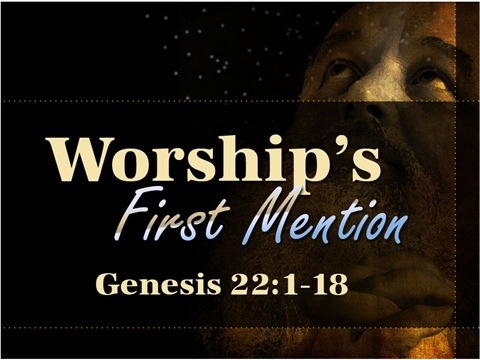 STEP 2 – When Abraham left his two servants behind to care for his mount, he said to them, “I and the boy will go over there and worship and come again to you.” His statement of faith was that they were both coming back! This is thinking outside the realm of reason; he would sacrifice the boy, but they would both come back. That is faith! STEP 3 – When Isaac asked, “Dad, where is the sacrifice?” Abraham replied, “God will provide” (v.8). Again, this in an unreasonable, audacious, bold declaration of faith. Abraham based it on what he had learned about God’s love, God’s character. I see here not only an extraordinary act of faith, but also a foreshadowing of the cross. What Abraham was willing to do with his son, God would actually do with His Son (on a hill called Mt. Calvary, in sight of Mt. Moriah). Jesus, the coming Lamb of God, is further pictured in the ram God provided as a substitute. Praise God for His gracious provision of Jesus, our Substitute! Salvation belongs to our God who sits on the throne, and to the Lamb!